Pope Francis’ popularity continues to grow as more Americans embrace his message of togetherness, community, inclusion and equality — a message that transcends partisan politics. Some people tell us to ignore Pope Francis. Conservative radio host Rush Limbaugh says Pope Francis is practically working for the Democrats. Republican presidential candidate Jeb Bush said he doesn’t look to the church for economic advice. They don’t think religion should influence economics. When it comes to the economic security of the American people, they prefer the profits of capitalism over the pope’s more progressive approach. But Pope Francis is rising above America’s sharply divided political landscape like a guiding light. His message is aimed at those committed to building an economy that works for working people, and to building a just and racially harmonious society. Poll after poll tells us Americans listen to the pope when he says our economy should reflect our collective priorities. I agree with Pope Francis: Work shouldn’t hurt people. It should lift us up. Too often today it does. Preventable accidents on the job literally kill and injure people every day. Chemicals and other workplace hazards such as silica and asbestos condemn too many workers to a slow death. My father and grandfather died of black lung disease. Work hurts families when parents have to hold multiple low-wage jobs to survive. It hurts our communities when corporate trade laws send jobs overseas. It hurts our future when we slash education funding to pay for tax cuts for millionaires. That’s less of a statement on the pope than on our badly broken political system in Washington. We want something different, and the pope’s words provide a vision for what we need. The AFL-CIO and a coalition of faith organizations recently commissioned a detailed national survey, and the results made it plain that the pontiff may stand apart from politics in America, but his words answer a deep need. Those polled say his moral clarity provides a guide as we look to the 2016 presidential election and the choices America will face. Our poll reached out to likely 2016 voters who described themselves as “religious” or “faith affiliated.” These voters told us they’ll listen closely to what Pope Francis says during his historic first visit to the United States in September. — 71 percent said American policies and law should hold to the Golden Rule — that we should do unto others as what we would have them do unto us. — 54 percent said we need a bigger and more open definition of community, so everyone belongs. Pope Francis has said we are all part of the same human family. We need one another and have shared responsibility for each other, regardless of our racial, political, cultural and economic backgrounds. — 83 percent of those polled say we as a society should not ignore the old, the poor, the sick and the uneducated, and that all people have value. — 79 percent think we have too much inequality and injustice, and our economy needs to be balanced for the benefit of everyone. Quite frankly, I think politicians would do well to put aside their short-term mindsets and listen closely to Pope Francis with an open mind and an open heart. His values are not fringe values. He stands for faith, hard work and decency. Those are mainstream values. Two out of three people in our poll said they have a favorable opinion of Pope Francis. His popularity is particularly high among Catholics (88 percent say he is “favorable”) and Latinos (71 percent say he is “favorable”), according to our poll. His clear voice cuts through the difficult times we face as American families. We’re plagued with worries as we try to pay for the things we want and need, even as we work harder and longer. Deep questions keep us up at night. Can we make ends meet next week? Will our children be able to find good careers? Can our nation overcome the pain and damage of racism? People are interested in what Pope Francis has to say about how we should honor our humanity together. I, for one, will be listening. 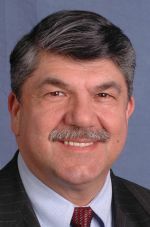 Trumka is president of the AFL-CIO, the largest federation of unions in the United States. Mr Trumpka stands for workers’ rights — not just union workers, all workers. When people have good jobs that can support families, life is better. The Pope asks us to be more inclusive, more forgiving and less judgmental. Let’s follow those directions and make this world a better place to live. Mr Trumpka stands for workers’ rights — not just union workers, all workers. When people have good jobs that can support families, life is better. The Pope asks us to be more inclusive, more forgiving and less judgemental. Let’s follow those directions and make this world a better place to live. Funny how Mr Trunka ignores Democrat (Catholic) politicians like Biden and Pelosi who ignore the Pope on abortion and gay marriage. The Pope is popular especially with the media who provide him good coverage unlike when they didn’t care for JPll and Benedict XVl. What is this partisan propaganda doing in a Catholic publication? Richard Trumka is a devout supporter of abortion, gay marriage and a lot of other grave evils that are in complete conflict with the Catholic faith. He also campaigns heavily for pro-abortion politicians, such as Pelosi, Obama, Biden, and H. Clinton. We don’t need any lectures from Richard Trumka about the Catholic faith. He is either ignorant of the Catholic faith or working directly to undermine it.